Although sacred structures of all sorts have been central to every culture throughout history, religious architecture has attained even greater importance in times of social upheaval. This was certainly true in mid-nineteenth-century Barcelona, the ancient Mediterranean port that became an economic powerhouse with the advent of industrialized textile manufacturing. As the strains caused by this rapid shift from small workshop to large factory production worsened, many felt that the Roman Catholic Church hierarchy was unresponsive to the travails of increasingly downtrodden urban laborers. Thus during the 1870s pious (and wealthy) barcelonés conceived a monumental building project for a working-class neighborhood that they hoped would stem religious disaffection by harking back to the devotional fervor, communal brotherhood, and civic pride fostered by the grand cathedral construction campaigns of the Middle Ages. Arxiv Temple Sagrada FamíliaThe Sagrada Família, the basilica designed by Antoni Gaudí from the early 1880s until his death in 1926, Barcelona, Spain, 2011The result is one of the most celebrated shrines in Christendom, known in Catalan as the Temple Expiatori de la Sagrada Família (Expiatory Temple of the Holy Family). It was begun in 1882 using the conventional neo-Gothic designs of Francisco de Paula del Villar, who after two years of persistent quarrels with diocesan supervisors quit and handed the job over to his largely untested assistant Antoni Gaudí. Over the next four decades Gaudí worked toward a church that would be both intensely personal yet embracingly universal, startlingly unprecedented though rooted in tradition, and altogether far more rich and strange than anything del Villar ever dreamed of. Although many cathedrals feature ensembles that depict the story of the Gospel, the program of the Sagrada Família sculptures makes most others seem rather subdued. Gaudí’s Nativity Façade, executed between 1894 and 1930, offers a paradisiacal vision of (holy) family life amid a panoply of grottoes dripping with stalactites, dense with leafy bocage, and alive with all sorts of fauna and flora. You have to look closely to find Jesus, Mary, and Joseph through all the busy detail. One can scarcely imagine what this teeming jumble would have looked like had it all been painted in polychrome, as Gaudí wanted to do in the manner of the ancient Greeks. Barcelona’s top tourist attraction, the Sagrada Família welcomes some three million visitors annually—nearly twice the city’s population—whose minimum admission fee of €15 has been the major source of revenue for completing the edifice. The architect is a cult figure not only in his native region, where he exemplifies the unruly Catalan spirit to political separatists, but as far away as Japan. There the hugely popular manga artist Takehiko Inoue—whose usual subject is basketball—recently published a book that seeks to pinpoint Gaudí’s inspiration, an ultimately futile task when it comes to such a complex, and to some extent inexplicable, figure. Few mainstream architects have dared emulate Gaudí directly. Today’s most obvious claimant to his mantle as maverick master is Frank Gehry, whose Olympic Fish pavilion of 1989–1992 in Barcelona (part of the Olympic Village erected for the 1992 games) exudes the antic energy of his antecedent’s biomorphic fantasias. However, the steel-mesh skin of Gehry’s design is uniformly detailed and tastefully monochromatic in a High Modernist mode antithetical to Gaudí’s colorful and irregular surface treatments. On the other hand, the alacrity with which the civic sponsors of the Guggenheim Museum Bilbao (1991–1997) accepted the American’s wildly unorthodox scheme says much about the persistence of the adventurous cultural attitudes Gaudí promulgated in Spain a century earlier. Astonishingly, given his current réclame, Gaudí languished in critical limbo for three decades after his death. The architectural historian Nikolaus Pevsner, single-minded in his promotion of a machine aesthetic, focused on Gaudí’s decorative impulse but largely ignored his considerable structural achievements. However, there was nothing at all capricious about Gaudí’s parabolas and catenaries, which he calibrated just as scientifically as his great engineering contemporaries did their innovations, and without any of the high-tech aids architects now routinely rely on. Although he scorned the use of buttresses as a lazy crutch, and was determined to find other ways to support the Sagrada Família’s high, thin walls, he also sought to avoid disasters like the collapse of the choir of Beauvais cathedral in 1284 or the tower of Ely cathedral in 1322. Gaudí gauged the strength of his arches and vaults with mock-ups from which he suspended sandbags on ropes to simulate the gravitational forces that would bear on the executed masonry, rather than depending solely on the mathematical formulae through which he arrived at his structural configurations. “I am a geometrician,” he insisted, a riposte to those who saw only willfulness in his deceptively arbitrary-looking forms. Nonetheless, menace lurks everywhere in Pevsner’s fretful surveys. Gaudí’s roofs are “like the backs of dinosaurs” and the ironwork of his balconies “might stab you at any moment.” Although Pevsner remained obtusely immune to the sheer bravura that has made Gaudí arguably the world’s most beloved architect, he later softened his tone somewhat and attributed that animus to an excess on his part of pro-Modernist zeal. Yet his earlier position helps explain why Gaudí’s work was hardly appreciated at the mid-twentieth century. Although the Expressionists and Surrealists had esteemed Gaudí as a fellow visionary, popular attitudes began to change dramatically in the 1960s, a decade of worldwide social and cultural ferment that made Gaudí’s work speak to a young generation alert to imaginative and expressive qualities long dismissed as pathologically bizarre, especially in architecture. Indeed, there is something almost psychedelic in his freewheeling aesthetic, characterized by distorted forms, propulsive patterns, kaleidoscopic colors, and quirky materials. The rediscovery of Art Nouveau during the 1960s carried Gaudí along with other newfound fin de siècle heroes of the burgeoning counterculture, including Aubrey Beardsley, Alphonse Mucha, and Louis Comfort Tiffany. Ulrich Conrads and Hans G. Sperlich’s illustrated history Phantastische Architektur (1960) contained several Gaudí designs and found an even wider audience in its English-language edition, The Architecture of Fantasy: Utopian Building and Planning in Modern Times. It is curious to note that Gaudí always designed taking into consideration the practical methods by which his plans could be carried out. He chose warped surfaces because model makers and masons can construct them easily, as both the hyperboloids and the hyperbolic paraboloids are ruled surfaces which can be easily reinforced by straight steel rods, thus providing a considerable economy. Growing public interest was reflected in shows of Gaudí’s work held at Richmond’s Virginia Museum of Fine Arts (1964) and New York’s Museum of Modern Art (1966). 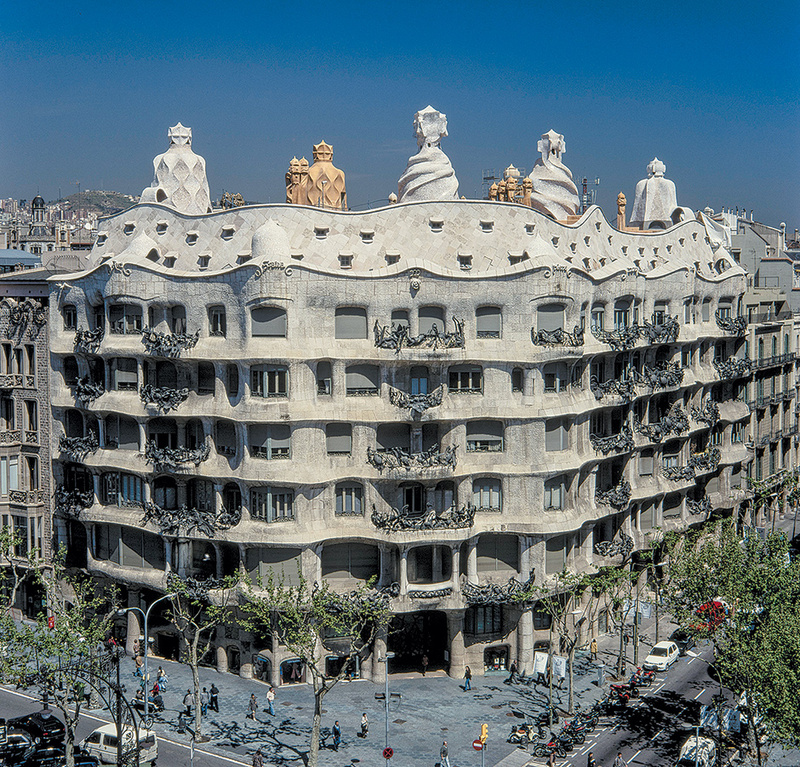 Although Gaudí has never wanted for admirers among his countrymen, it was the Columbia architectural historian George R. Collins (1917–1993) who made a long-overdue international reappraisal that became one of the most successful attempts to elevate an artist’s critical standing in modern times. During a 1959 research trip to Spain, Collins came upon a large cache of unpublished Gaudí drawings and the following year published Antonio Gaudí, the first English-language monograph on the architect (using the Castilian, not the now-preferred Catalan, version of the subject’s first name). Only 136 pages long, this tour de force of concision and insight emphasizes Gaudí’s structural genius and remains an unsurpassed introduction. Collins followed his breakthrough with further publications (including a pioneering bibliography) and exhibitions, and established a previously missing transatlantic link. Gaudí drew on age-old Catalan construction systems, specifically the region’s tradition of lightweight tile vaulting able to span large overhead spaces. This technique can be traced back to fourteenth-century Spain but may have had its origins in similar methods devised by the ancient Romans, who colonized Iberia. Although Gaudí’s buildings were contemporary from the ground up, their foundations invariably followed traditional Catalan prototypes, and he heeded masons who shared their inherited knowledge of what was (and was not) structurally possible. Gaudí’s emergence paralleled that of Rafael Guastavino, a decade-older Barcelona contractor-builder rather than an architect, who worked for at least one major Gaudí client, the Batlló textile manufacturing clan. Guastavino regularized and industrialized the cost-efficient, fire-resistant Catalan method of tile vaulting and introduced it to the US at the 1876 Philadelphia Centennial Exposition. After he immigrated to the US five years later, Guastavino established a thriving concern that supplied Catalan-style roofs and ceilings to hundreds of architectural firms over the next eight decades. When the Guastavino family business closed in 1962, Collins, already alert to this connection on a stylistic basis, singlehandedly saved the company’s archives from destruction and thus helped future scholars demonstrate that Gaudí was a figure of far more than regional influence. No wonder that the city of Barcelona in 1999 renamed a street bordering Gaudí’s Finca Güell the carrer de George Collins. In Sagrada Família—the book of the illuminating exhibition recently held at the City College of New York’s architecture school, curated by George Ranalli and Fabian Llonch—the architectural historian Judith Rohrer writes that the expiatory temple (originally meant to house pharos-like searchlights in its pinnacles) was intended to “serve as a beacon of faith, proclaiming the revived piety of the Spanish people, while atoning for the sins, both public and private, of a modernist, materialist age.” The strain of deep conservatism implicit in that formulation—which brings to mind the militant antimodernism of Pope Pius IX, who died shortly before the Sagrada Família’s inception—makes one understand why proletarian radicals did not necessarily view this costly exercise in spiritual advertisement as a social improvement program. Arxiv Temple Sagrada FamíliaA view of columns and vaults in the nave of the Sagrada FamíliaThe new church was dedicated to the Holy Family because Saint Joseph was a carpenter with whom the city’s laborers might personally identify. But empathetic feelings among that target audience were perhaps undermined when the architect’s iconography for the Temptation portal (one of several thematic groupings that in addition to the Nativity include the Rosary, the Way of the Cross, and the Crucifixion) revealed a figure of a demon proffering a workman a spherical Orsini bomb—the handheld weapon favored by fin de siècle anarchists. 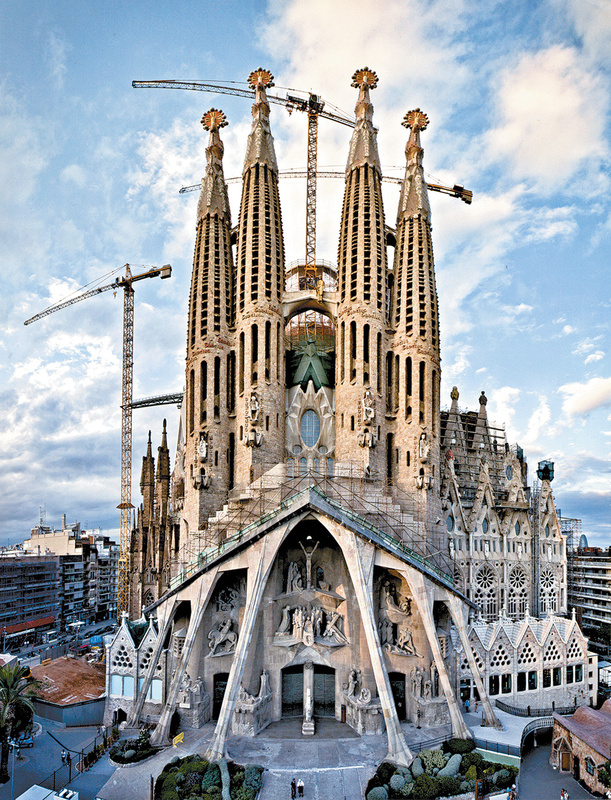 Thus despite the populist appeal of the Sagrada Família’s exuberant forms and idiosyncratic decoration, a severely critical undertone lodged in some people’s minds. Lingering resentment took a violent turn when in 1936, during the Spanish civil war, Republican rioters broke into Gaudí’s old studio and destroyed his plaster models for the church. (The CCNY show included twenty-one newly made plaster maquettes, some of them full-scale renderings of building details.) Indeed, as late as the 1960s, when my wife, Rosemarie Haag Bletter, a graduate student of Collins’s, did research in Barcelona on Gaudí’s lesser-known contemporary Josep Vilaseca, she was habitually quizzed by different factions about her attitude toward the completion of Gaudí’s building, a political litmus test under the Franco regime, which looked upon gaudísme as a seditious cover for Catalan dissidents. This was a tricky question to answer in any case, because Gaudí certainly realized that no one designer could live long enough to see such a grandiose endeavor through to completion. And although he left detailed instructions for parts of the structure still unbuilt during his lifetime, he expected (and accepted) that other designers would put their own, likely quite different, stamp on the structure, as happened with cathedrals such as Chartres, with its mismatching Early Gothic and Flamboyant spires. 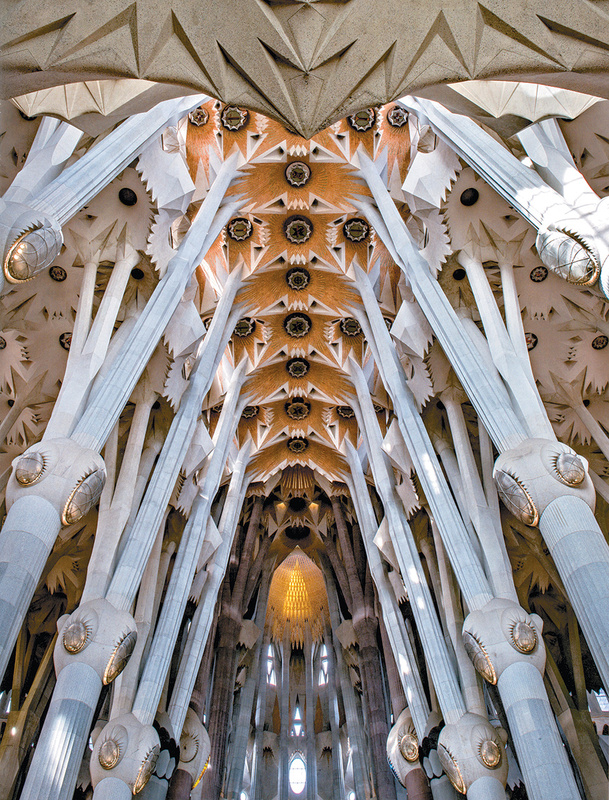 “Great temples were not the work of one architect,” Gaudí observed, but as the CCNY exhibition and catalog indicate, those in charge at the Sagrada Família today have drawn on his work to the exclusion of all other possibilities. To be sure, a highly skilled, deeply dedicated group of architectural, engineering, and decorative arts professionals has been directed since 2012 by the Barcelona architect Jordi Faulí (who spent the preceding two decades as an associate on the project). The team is hewing as faithfully as possible to the letter of Gaudí’s vision, but one wonders about the spirit. As a visit to the Sagrada Família today indicates, there is such a thing as being too conscientious, an impression confirmed by the excellent color photos in the recent New York show. Employing the most advanced computer imaging technology, it has been possible to reconstitute elements once thought irretrievably lost after Gaudí’s models were shattered. Yet the newest portions of the Barcelona landmark utterly lack the tactile quality of the parts of the Sagrada Família carried out while Gaudí was alive. The sense of an artist being physically involved is conspicuously missing from the most recent additions there. There is a certain angularity to the forms that emerge in this model, less fluid in its continuity than Gaudí’s earlier work. While not abandoning the ruled surfaces of double curvature that were so much a part of his structural thinking, he nevertheless turned in the last phase of his work toward intersecting and interlocking polyhedral geometries that yield an angular, prismatic, crystalline, almost cubist effect. Although translating Gaudí’s reconstituted designs for the Sagrada Família into building components has been made infinitely easier by digital scanning programs, there is a world of difference between the sharply rendered parts that emerge from this process and the far more improvisational results Gaudí was able to coax from artisans on site, his habitual working method. Given the figurative arthritis that set into Gaudí’s supple organic forms late in his career, strict fidelity to those last pieces of work might not have been the wisest course. The newly completed nave of the Sagrada Família looks disturbingly fake, and in many places jarringly slick, especially the grid-patterned, polished stone floor that brings to mind the lobby of a 1980s corporate headquarters by Philip Johnson. Perhaps in the fullness of time all this bright, precision-cut stonework will mellow into pleasing decrepitude, but that now seems unlikely. Antoni Plàcid Guillem Gaudí i Cornet was born in Catalonia in 1852, though it remains unclear whether that occurred in the town of Reus, where his father and grandfather worked as coppersmiths, or in the family’s ancestral village of Riudoms. The architect attributed his innate sense of volumetric enclosure to his antecedents’ skilled craftsmanship of boilers, kettles, and other heating devices. Whether or not Gaudí’s virtuosic grasp of irregular forms was genetic or acquired through close observation, he could visualize space in three dimensions, an attribute far from common among the general public and not to be taken for granted among design professionals, either. As the art historian Gijs van Hensbergen relates in his absorbing Gaudí: A Biography, from an early age the future architect displayed an exceptional aptitude for mathematics, and as a teenager he and two friends dreamed up an imaginative if overreaching scheme to turn a derelict local monastery into a full-service tourist destination. Instead of encouraging his progeny to continue in the family trade, Gaudí’s father sold inherited land to help finance the medical studies of Antoni’s older brother and then his second son’s architectural education at Barcelona’s Escuela Superior de Arquitectura. There have been numerous studies of Gaudí’s many sources of influence, especially the authoritative French architect and theorist Eugène Emmanuel Viollet-le-Duc, whose combination of eclectic historicizing motifs and modern industrial materials is everywhere evident in Gaudí’s oeuvre. But there is also a psychological complexity to the Catalan master’s work that sets him above and apart from not only other European practitioners of his time but also from the most talented of his contemporaries in Barcelona. For all his stunning ingenuity, Gaudí did not emerge from a cultural vacuum, and he was but one—albeit the most extravagantly gifted—among an extraordinary generation of local architects who espoused the new credo of Modernisme, the distinctive Catalan variant of Art Nouveau, which drew heavily on the Romantic revivalist Renaixença (renaissance) movement of mid-nineteenth-century Spain. This brilliant cohort included Lluís Domènech i Montaner (creator of Barcelona’s stupendous Palau de la Música Catalana), Josep Vilaseca i Casanovas (who designed the city’s neo-Moorish Arc de Triomf), and Josep Puig i Cadafalch (whose step-gabled Casa Amatller stands next to Gaudí’s saurian-roofed Casa Batlló of 1905–1907 on the Passeig de Gracia, Barcelona’s street of Modernisme dreams). There was a strong measure of competitive display among Barcelona’s new industrial elite, and they vied with one another in hiring these and other exponents of the new architecture to design domestic showplaces of unabashed grandeur. If a tycoon’s town palace could directly advertise the source of his wealth, so much the better, as Gaudí achieved with his first major residential commission, Casa Vicens (1878–1880), a multicultural extravaganza for a brick and tile manufacturer. (Now being restored, it will open to the public for the first time next year.) This learned exercise in the Mudéjar style—the term refers to Muslims who remained in Spain after the expulsion of the Moors—juxtaposes panels of blue and white tiles in a bold checkerboard pattern against tawny brick worked into daring variations on traditional themes of the Mozarabic Arabs (Iberian Christian Arabs who lived under Moorish rule). Ramon Manent/Art Archive/Art ResourceCasa Milá (1906–1910), Gaudí’s six-story apartment building in Barcelona that, Martin Filler writes, is ‘popularly known as La Pedrera (the quarry) because of its craggy, cliff-like elevation and flowing horizontal lines’Accomplished as Casa Vicens is, it exhibits none of the curvaceous organic continuity that Gaudí attained in his later work, exemplified by Casa Milá (1905–1910), a six-level Barcelona apartment building with an undulating façade that turns a chamfered corner between two perpendicular streets. Clad in limestone, this landmark is popularly known as La Pedrera (the quarry) because of its craggy, cliff-like elevation and flowing horizontal lines of the projecting cornices on each story, which evoke the layering of geological strata. Another hallmark of Gaudí’s architecture is ceramic embellishment. Although mosaics have been incorporated into buildings since Classical antiquity, he eschewed purpose-made components and instead appropriated irregular shards of domestic pottery in a Catalan technique called trencadís. Embedded pieces of broken dinner plates and teacups are readily identifiable on the crazy-quilt surfaces of several of the architect’s constructions in the Park Güell (1900–1914), where a quite friendly trencadís-encrusted dragon welcomes visitors at the entrance stairway, and the undulating Sea Serpent Bench, similarly enriched with recycled crockery, offers a dazzling resting place and vantage point on the central terrace overlooking Barcelona and the sea beyond. Gaudí’s most important private patron was the textile magnate Eusebi Güell i Bacigalupi, for whom he executed five major commissions in and around the Catalan metropolis. First of these was for Bodegas Güell (1882–1897), a winery in the seaside town of Sitges southwest of the city, which remained in operation until 1936. Next came Palau Güell (1885–1889), an imposing mansion erected not in a plutocratic enclave but in what was then the city’s artists’ quarter (during the early 1900s the young Picasso’s studio was directly across the narrow street). The building’s otherwise severe masonry façade is dominated by a powerful pair of parabolic entry and exit arches screened with intricate ironwork in the form of coiled snakes that surround the initials “E” in one portal and “G” in the other. The architect’s expansion of the industrialist’s country estate, Finca Güell (1887), was followed by his primitive chapel at Colònia Güell (1898–1915), the enlightened industrialist’s company town. With its cavernous interiors and mysterious lighting, this jewel-like sanctuary seems a direct precursor of Le Corbusier’s Ronchamp chapel. Last in this remarkable series was Park Güell, a hillside residential development based on recent English garden city prototypes. However, it failed as a real estate speculation and was turned into a municipal park. On this forty-two-acre site Gaudí designed a host of endearingly strange infrastructural features, including cascading stairways, snakelike pergolas, arcades composed of tilting columns, as well as habitable follies for caretakers of the lushly landscaped property.